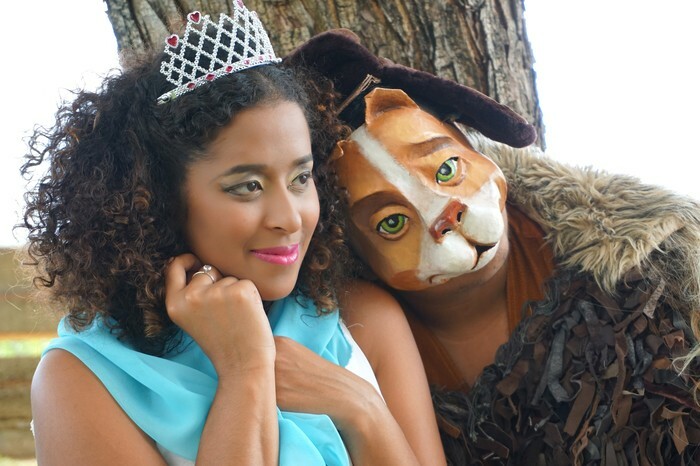 Children's Theatre Performs On The Leeward Theatre Stage! 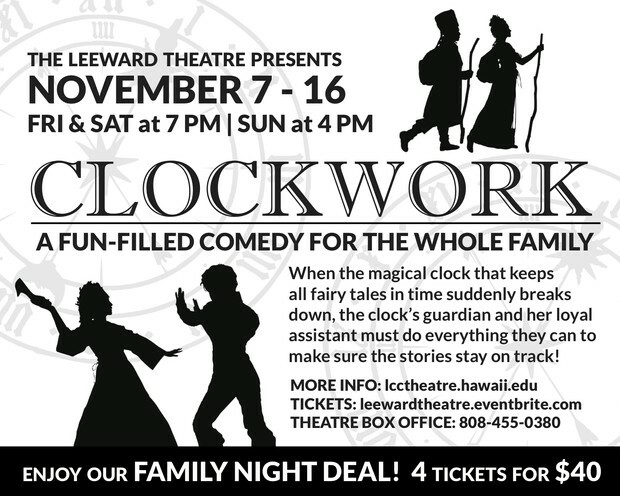 Leeward Community College presents the hilarious family-friendly comedy Clockwork by Kemuel DeMoville and directed by Leeward's own Theatre professor Betty Burdick! 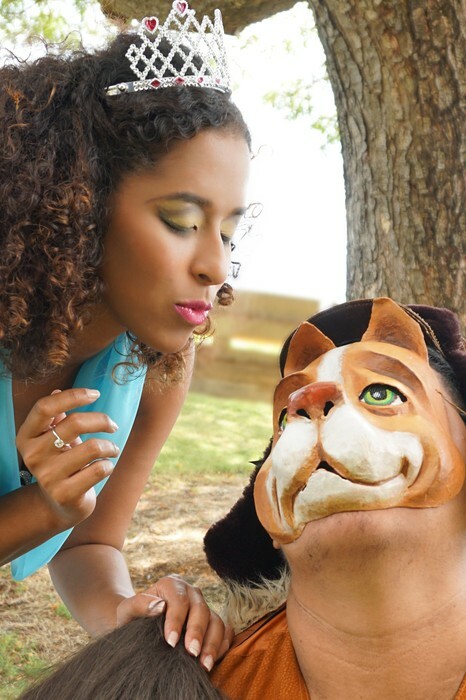 This is a world premiere production of the play. 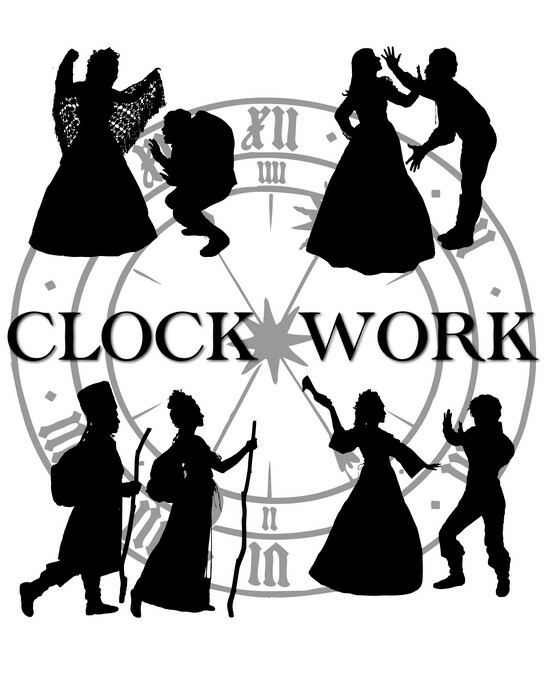 When the magical clock that keeps all the fairytales on track suddenly breaks down, Janice the clock’s guardian, and Morton her loyal helper, try to do everything they can to keep the stories on track. 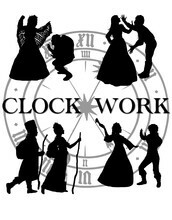 While Janice takes on the role of both Cinderella’s fairy godmother and the witch who curses Sleeping Beauty, Morton is forced to disguise himself as Snow White (since the real Snow White escaped as soon as the clock broke). 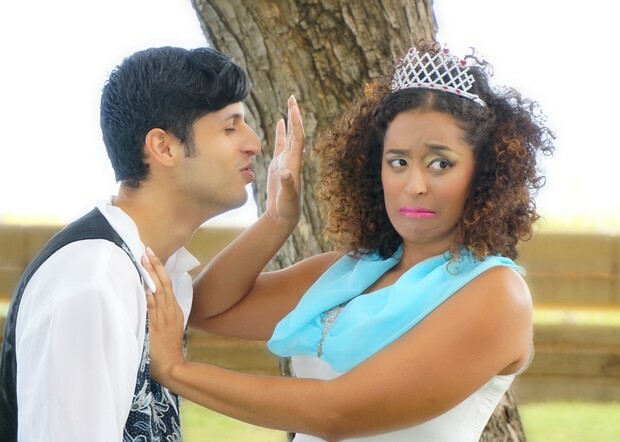 A series of misguided magic and mistaken identities leave one handsome prince turned into a frog, Morton engaged to Sleeping Beauty (a real Beauty and the Beast), and Cinderella acting as Janice’s new apprentice. The play is written in the style of a French Farce and moves from one complication to the next with fast-paced hilarious results. There are chases throughout: through the forest, through the clock tower, and even through the audience! Finally a giant dragon storms the stage to untangle the stories and get them back on track - but don't expect any traditional endings here (everyone just feels lucky not to get eaten)! 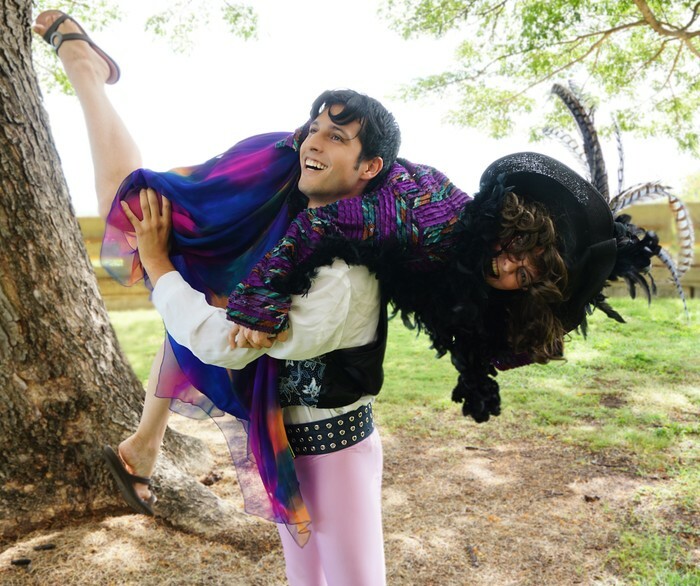 Children and adults alike will both find things to laugh at in the fun-filled comedy. 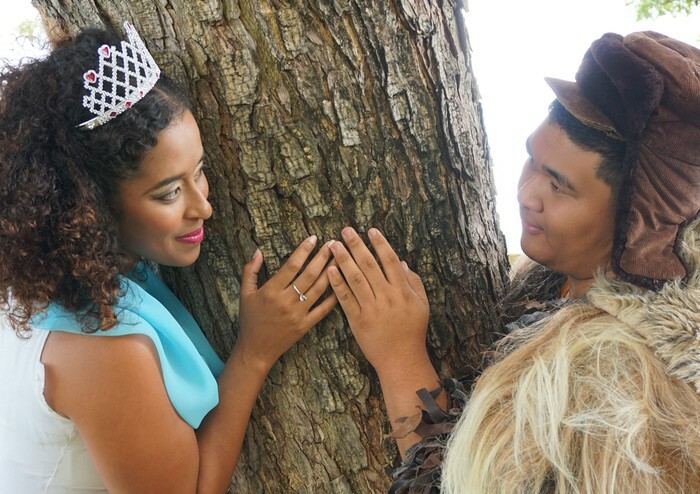 Local playwright Kemuel DeMoville wrote the piece while he was an MFA candidate at UH Manoa in 2009. Since then the play has had several readings, but no full production. DeMoville is donating his royalties back to the Leeward Theatre since he is currently serving as the Theatre Manager for the Leeward college and felt it would be a conflict of interest to accept any payment for the production. 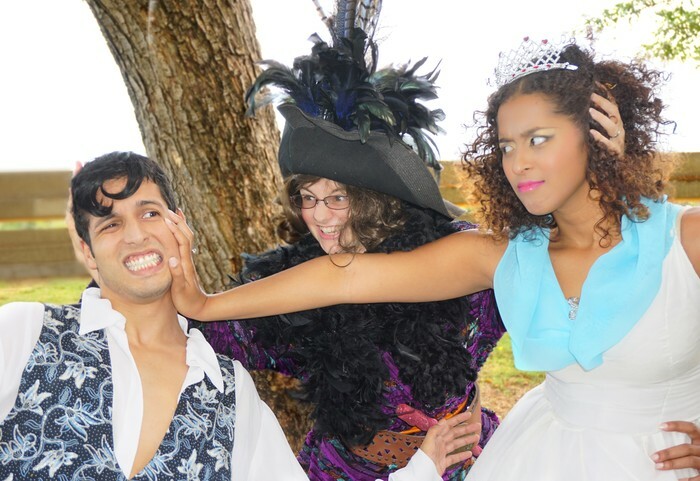 Bring the Whole Family to this Hilarious Fairytale Farce! 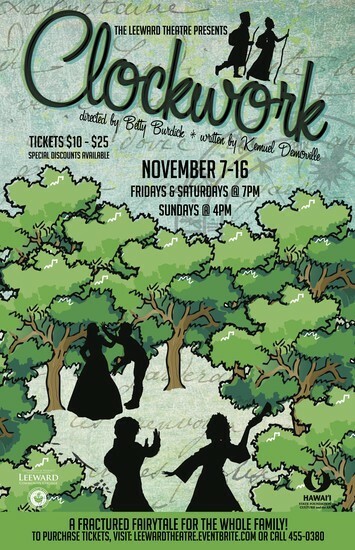 808-455-0380 OR box office will open one hour before show time. COST: $25 General; $20 Military/Seniors 55+/UH Students, Faculty, Staff; $15 Leeward Community College Students/Children 18 and under.